The Samsung Galaxy Gear may have been the first smartwatch of its kind on the market, but many were left underwhelmed by its lack of functionality. Since it’s release however, the Samsung Galaxy Gear has seen a number of developments, and there are still a lot more to come, one of which is the ability to control your car. 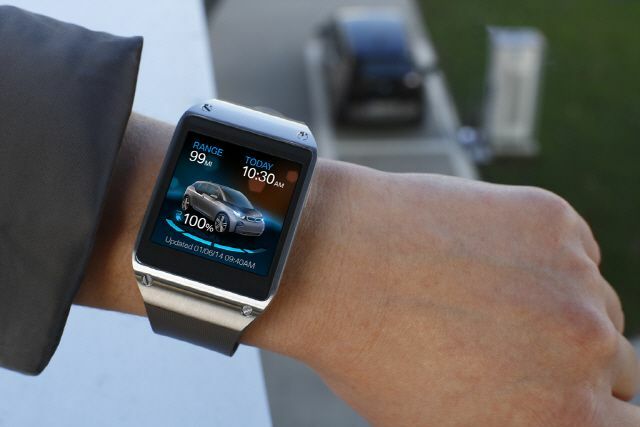 Samsung has showed off it’s new technology at CES 2014 in partnership with BMW to demonstrate how the Samsung Galaxy Gear can be used to control the BMW i3 electric car. The BMW i3, the world’s first fully connected electrically-powered car, features an integrated SIM card, giving drivers access to the vehicle from anywhere at any time. By utilizing the BMW i Remote Application, drivers can share information with the vehicle directly through their mobile device to perform useful functions from being able to access the battery life and driving range to checking to see if the windows are shut or adjusting the car’s climate remotely. The Galaxy Gear connects to the BMW through the i Remote application which provides real time updates and information about the car to the Galaxy Gear without having to take the smartphone out. It essentially takes the standard operation of what the Samsung Galaxy Gear does with other Samsung based functionality being paired to a smartphone, and extends capability out to the BMW. The Galaxy Gear will also allow the user to remotely regulate the temperature of the BMW i3 before even getting into the car. That can be controlled using either the touch based UI or Samsung’s S-Voice speech recognition. Furthermore, the ‘Send-to-Car’ feature can be used for users to trigger S-Voice to send addresses directly to the BMW i3 navigation panel. The i Remote app is just a proof of concept for now, but it shows the Samsung Galaxy Gear is getting the development for improvements in functionality in needs to really make an impact.